This idea has been merged into another idea. To comment or vote on this idea, please visit Link / Merge Community Profiles. Inform users, when they login, that they should register a developer edition org to maintain and keep their identity. 1. One keeping a user presence, history, messages, etc. is very important. 2. Eliminates question of which account users should register in success. 3. 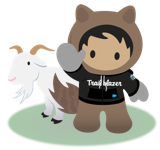 Eliminates the need for users to open a case to Salesforce to ask to transfer activity, cutting down on associated time and effort. Yes, this is important. I lost my access to my Dreamforce sessions because I used my old work account to register for Dreamforce. So now I can't download the powerpoint slides from my sessions. Now I use a non-work account for the Success Community, and next year I will (try to) register for Dreamforce using this developer org, I hope? Do they allow Dreamforce registration from a developer account login? I agree with the intent of this idea. There is an an older and similar idea with a lot more support that could use your support called (link included) Link / Merge Community Profiles. I always recommend users get a dev org so they can take their history with them no matter where they go. Yes yes yes!!! This woudl be like loosing my twitter account because I moved jobs. It's part of my online identity. Yes!! I am changing jobs right now and am dreading having to set things up all over again. This would be a huge benefit to everyone. this is super important!! no one wants to lose their activity and presence in the Success Community! !